Second, enjoy a simple technique for clearing your mind. When learning how to meditate, first choose a quiet place where you will not be disturbed for ten minutes or more, and be seated in a comfortable position. You may choose to sit in the traditional cross-legged posture but this is not necessary in order to gain the benefits of meditation. Allow your eyes to relax closed, or leave them open just a tiny slit, and focus your attention on your breathing. Breathe naturally through your nostrils. Avoid trying to control the breath and focus your awareness on the sensation of the breath as it enters the body – the cool feeling in your nostrils, and the warmth as it leaves. Feel the rising and falling of your chest and abdomen, and let a steady rhythm of your breathing in and out be the object of this meditation. Concentrate on your breathing, especially the exhalation, to the exclusion of everything else. You may discover your mind will be very busy with mind-chatter. At first it may seem meditating is making your mind even busier. This is an illusion; you are simply becoming more aware of how busy your mind is, ALL THE TIME. Continue your focus on your breathing. Ignore random thoughts that may tend to clutter your mind. Let them slip away; focus on your breathing. You might imagine that the thoughts leave your mind with each exhalation. Practice this for 10-20 minutes once or twice a day. You will soon notice your mind feeling clearer, not only right after you sit, but throughout the day. You may or may not notice the benefits of meditation immediately. These methods of meditation require attention – and practice. Don’t expect that you will eliminate all the mind chatter on your first or second try. Stick with this process as a daily practice and you will soon be able to evaluate it’s effects. Though meditation may seem frustrating or a bit tiring at first, after daily practice and patience, you will find the distracting thoughts subside and eventually yield to a deep sense of restful alertness and deep relaxation. 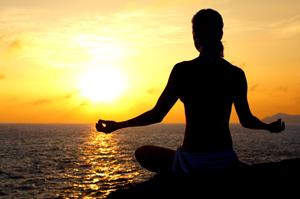 You will feel refreshed and think more clearly at the end of your meditation exercise. Similarly, as you quiet your distracting thoughts through your focus on your breath, you achieve the clarity that you so desperately crave. Stay with this Breath and Mind Clearing meditation exercise for a while. You will rapidly feel positive physical and emotional results with daily meditation. Allow yourself the time to enjoy this Breath and Mind Clearing meditation technique and notice a decrease in stress and the open feeling that comes to your relaxed mind. Although one of the goals of meditation is learning how to let go and flow with your own deeper guidance, it is often very beneficial to experience guided imagery audio meditations. The voice serves as a focal point and the music masks any background noise. Excellent for learning these first steps are Rainbow Butterfly, Healing Journey, Relaxation and Inspiration, and I Am: Awakening Self-Acceptance. Visit our Online Store and see The Total Stress Relief Suite, each of the recordings there will help you learn to return to center in many ways.